Is it possible to mitigate risks of using a wifi connection that uses a self-signed security certificate? I don't really know anything about security certificates, and I tried reading about this, but couldn't find the answer. Edit: The hotel I'm staying in uses a login page for the wifi connection that uses a self-signed security certificate. I'm hesitant to connect my laptop to it because of this. My wlan card isn't attached to the host machine, but rather a VM within it. The internet connection is passed to another VM that implements a firewall (from archlinux wiki on "Simple Stateful Firewall" page), which is then passed to a VM that handles my VPN connection, then to other VMs that actually use the connection for whatever. Would it be safe to use this wifi connection? A wifi network with a badly-configured CA certificate (or a CA certificate that they only give to employees) is no worse than an open network with no certificate. Would you still connect if it was an open wifi? If yes, then don't worry about it. I'm assuming you're talking about the certificate that the wifi presents during connection? Something like this? My understanding is that this exists to prevent SSID spoofing (ie an attacker parks a van outside your house and broadcasts a network with the same SSID as yours). 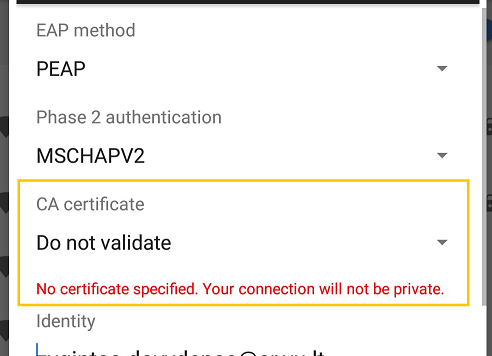 When you connect to a wifi network, it can present you a certificate that cryptographically proves that it is the network that it claims to be (provided that you trust the Certificate Authority that issued that cert -- hence the UI thing about whether you trust the CA). Would you trust it if it was an open network? It sounds like the hotel configured this with a self-signed certificate. Maybe that's so hotel employees, or hotel equipment can download the CA cert and be sure nobody is doing an SSID Spoofing attack on them. Would you still connect if it had been an open network with no certificate? If the answer is Yes, then don't worry about it. If the answer is No, then you probably know something about this network and what cert it should be displaying, and wouldn't be asking this question in the first place. One last note: We are talking about trusting a CA to identify the SSID during wifi connection. Note that this is different than trusting a CA to identify a website in your browser. If they ask you to download a CA cert and install it into your operating system, that would be a red-flag, because now they can impersonate any website that you try to connect to. Is a VPN the only way to protect against rogue Wifi access points MITM attacks? Is it possible to create a self signed certificate authority?